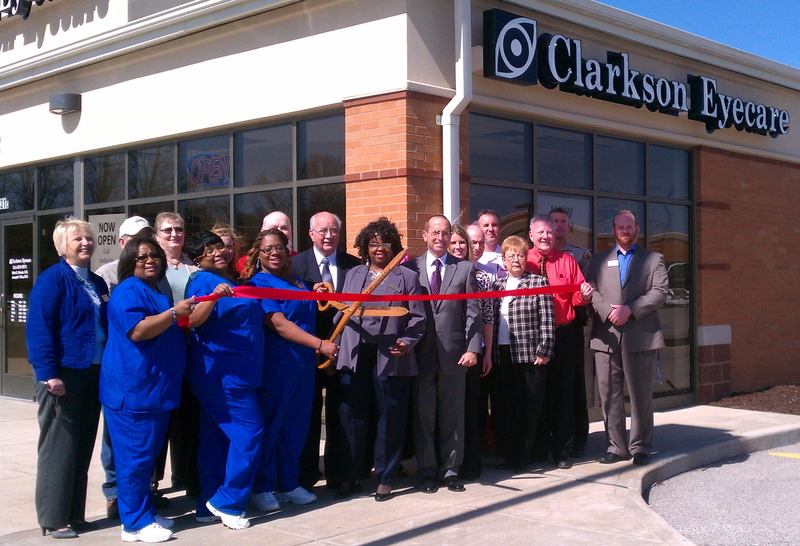 The new Clarkson Jennings office is located at 8031 West Florissant Ave., Jennings, MO 63136. The new office opened for patient care on Monday, March 5th. Clarkson Eyecare is pleased to announce the opening of its new Jennings office at 8031 West Florissant Ave., Jennings, MO 63136. The new office opened for patient care on Monday, March 5th. The new office is located in the Buzz Westfall Shopping Center, just North of Lucas and Hunt Rd. It includes two state-of-the-art exam lanes and modern dispensing stations to serve patients. The doctor at the Jennings office is Eliot Masek, O.D. The Jennings location offers a complete line of primary and secondary professional eye care services including full medical and vision eye examinations, contact lens fittings, emergency eye care, and treatment of eye diseases. Clarkson Eyecare also offers a large selection of retail eyeglasses, sunglasses, contact lenses, and accessory products. The new Clarkson Eyecare Jennings office is open Monday and Thursday from 9 am to 7 pm; Tuesday, Wednesday, and Friday from 9 am to 6 pm; and Saturday from 8 am to 1 pm. The phone number is 314.222.2071. Founded in 1979 by Dr. Lawrence Jehling, Clarkson Eyecare currently offers comprehensive medical eye care services at 54 metro St. Louis locations: 141 & Olive, 79 Crossing-St. Peters, 94 Crossing, Arnold, Ballwin, Bogey Hills, Brentwood, Butler Hill, Chesterfield, Chesterfield Valley, Central West End, Creve Coeur, Des Peres, Downtown, Ellisville, Eureka, Farmington, Fenton, Festus, Florissant Dunn Rd., Florissant Hwy 67, Hawk Ridge, High Ridge, House Springs, Imperial, Kirkwood, Maplewood, Mid Rivers, Oakville, O’Fallon-North, O’Fallon-South, Pacific, Perryville, Rock Hill, South County, St. Louis Hills, Town & Country Mason, Town & Country Crossing, Troy, Union, Warrenton, Washington, Webster Groves, Wentzville, Wildwood, MO, Belleville, Columbia, Edwardsville, Fairview Heights, Granite City, Highland and Shiloh, IL, and LASIK Surgery Center in Chesterfield Valley and Fairview Heights. Go to http://www.ClarksonEyecare.com or call 888-EYECARE for more information.